Can't decide whether to stay in Ephraim or Sister Bay? Consider the Nordic Lodge. It has a super location just a mile and a half from downtown Sister Bay and two and a half miles from downtown Ephraim. But that's not the only thing you'll like about the Nordic Lodge. There are a lot of the things we liked when we toured. In a private and secluded setting in a wooded area, the Nordic Lodge is close to great shopping areas abundant with galleries, shops and restaurants, walking distance to Pebble Beach (public), resort amenities like an indoor pool and indoor whirlpool and clean, comfortable rooms at very reasonable prices. Looking for more luxurious accommodations? Read on to find out about the Nordic Lodge Suite and more! Upgrades - they keep on improving the property! In 2014, new flooring and furniture was added to the lobby area, and they have also painted, and installed new drapery and bedding, in each of the guest rooms. And they also converted some of the 2 "full" bed rooms to 2 "queen" bed rooms and now offer a few more king rooms on the first floor. More choices for you! Also, starting in 2014 the have determined to allow dogs to stay in designated pet friendly rooms. So bring the pooch (call ahead to get one of these special rooms though). The Nordic Lodge with its 33 rooms (32 guest rooms and 1 luxury suite) is run by a friendly staff that makes any visitor feel at home. We feel quality service provided with consistency is always an assurance that you will enjoy a clean, well-kept room no matter where you vacation. Here, the dedicated staff is a great indicator of the caliber of services you'll receive. The entire staff is very detail orientated and will make your stay a very pleasant experience! And you will find free wireless internet access available too! Guest rooms at the Nordic Lodge have either double or king beds, private bathrooms with tub/shower, color television with cable, telephones, air-conditioning and small refrigerators. The rooms we viewed were very clean, as you would expect. Basins with mirrors placed outside of the bathroom itself helps make getting ready easy. The rooms are styled in contemporary oak, and are quality built. Rooms are fully carpeted with tiled bathroom floors. Rooms we viewed (and we viewed most of them!) all had two night stands on either side of the bed, a chest of four drawers, a table with two chairs and a sliding glass door leading to a patio or deck with two chairs and a small table. 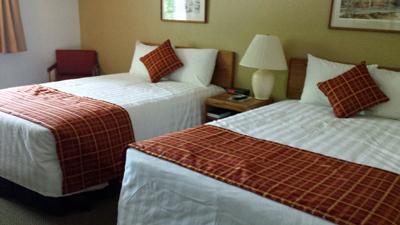 Like we mentioned, rooms are very well kept, clean and overall very comfortable. Rates vary depending on day of week and the month, so please call the Nordic Lodge for exact and current rates and specials, or click here to their rate sheet. The Nordic Lodge Suite is located on the main floor. The suite features a really nice kitchen, large living room with gas fireplace and a spacious dining room area. The kitchen is user friendly with loads of counter space and cupboards. Everything you might need is provided including microwave, dishwasher, oven, stove top, refrigerator, coffee maker and a nice double stainless steel sink with disposal. You can prepare and serve your meals with the culinary, cooking and serving utensils provided. The living room is nicely laid out as well and comes with two comfy blue reclining rockers, a large sleeper sofa, large coffee table, table and lamp between recliners and floor lamps all situated around a gas fireplace with a brick hearth and cedar beam for a mantel. Lots of natural light from the sliding glass doors and a large bay window make it bright and cheerful. This room is really nice and easy to move around in. The dining area is off to the right of the living room and has a round oak table with four chairs, is very spacious and shares a set of sliding glass doors with the living room that lead to a covered patio with nice white deck furniture. Of course, there is a master bedroom featuring a king size bed with an oak headboard. Two reading lamps are mounted on the wall overhead and there is a nightstand with a clock to the right of the bed. There is also a desk, chest of drawers with mirror, luggage rack and a large closet for personal storage and extra pillows and blankets. The room itself is carpeted and very welcoming. The indoor, heated pool area at the Nordic Lodge is for registered guests only. This is nice because it provides you with easy access in an uncrowded atmosphere. The pool room has vaulted cedar ceilings and is lined with ten windows providing lots of outdoor light. There are carpeted areas and plenty of tables and lounge chairs for your comfort. Off the pool room there is another room that has a round, eight- person hot tub. Completely trimmed out with cedar, this room also has nine windows to let the sunshine in! Really folks, the indoor pool and hot tub rooms can be compared to the amenities you would expect from any top-notch resort. That's not all! From the pool room there are two separate doors leading to an awesome sunbathing deck! The deck wraps around two sides of the pool room and has a view to the North of the woods and the Sister Bay hill. You'll find that plenty of deck furniture and flower boxes under the windows and more flowerpots lining the deck make this a great place to relax. Wow! Did we forget anything?!? Oh yeah, the Nordic Lodge is a totally non-smoking facility, is open from May 1st to the end of October, and allows children too. There is a nice sunning deck with tables and chairs for relaxing and unwinding, and a light, continental breakfast with juice is served each morning! Sorry, no pets allowed. If you are looking for comfort, quiet and convenience, all at a great rate, check out the Nordic Lodge located between Ephraim and Sister Bay. We loved it! So visit the Nordic Lodge website, and please be sure to tell them you found them on DoorCountyNavigator.com! This is Property ID# DCNAV-2721.